Dr. Kate Raynes-Goldie has been playfully preparing humans for the future since 2003. A technology analyst, trained ethnographer and professional game designer, Kate mixes the playful and the serious to engage audiences with compelling stories and useful insights. The Future of Work Imagine if your organisation was given the jump on social media before it changed everything. How valuable would that have been? It’s all happening again, this time with multiple technologies, including Artificial Intelligence (AI), Virtual, mixed and augmented reality (VR/AR/MR) and blockchain, just to name a few. This is your chance to get ahead of the curve and leverage the next big disruption [download flyer]. Kate is the Founder of Future Human Academy, which prepares young people for the future of work; and Playup Perth, an event series that showcases and supports creative innovation in Western Australia. 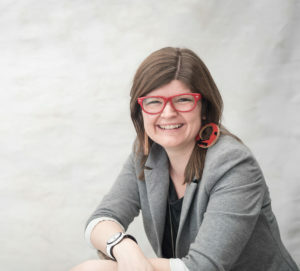 Kate has spoken at top academic and industry conferences, including SXSW (Austin), NXNE (Toronto) and TEDxPerth where she is also a speaker coach, and has been featured on MTV, BoingBoing, NPR and in the pages of ELLE and the Sydney Morning Herald. Kate also writes for a variety of publications in Canada and Australia, including The Conversation and Kotaku. She is currently a technology columnist for the Business News and Scitech’s Particle, where she covers everything from Lego to blockchain to Nintendo’s latest innovation. Her ability to identify key trends and explain in an accessible way are rewarded by her articles being some of the most read and shared. Her PhD on Facebook has also been in Curtin Library’s top 10 most downloaded (of all time!) list since it was published in 2012. Kate has also been playing with reality since 2007. Her award-winning mixed and augmented reality (MR/AR) games have been played all over the world, including at the National Theatre (London), Toronto International Film Festival and IndieCade (San Francisco). Her current project, “Secret Agents of Happiness” invites players to engage with those around them with random acts of joy and kindness. Kate has worked with a wide variety of clients from different industries, including the Office of the Privacy Commissioner of Canada, Deakin University, Bankwest, RAC WA, Knowledge Week and Health Canada. Kate has won multiple international awards for her work, including WAITTA Incite’s Achiever of the Year 2015/2016; the Australian Computer Society’s Digital Disruptor Professional Achiever of the Year (2016); and one MCV Pacific’s 30 most influential women in games for three years running. Kate is also a nominee for the 40 Under 40. She holds a PhD from Curtin University’s Department of Internet Studies, where she is also an Adjunct Senior Research Fellow, and a graduate of the Canadian Film Centre’s New Media Lab, where she previously taught. Kate is an Affiliate Member of Professional Speakers Australia and an Honorary Member of the Australian Computer Society.